His great grandfather Mike, a Slovak, fled communist Czechoslovakia in the 1950s. He landed in a refugee camp in Halifax and eventually made his way to Toronto. A lawyer back home, Mike took a job as a janitor to survive. A few years later, he became aware of another Slovak, Stan Mikita. Born Stanislav Gvoth, Mikita moved from a small, rural farming community in Czechoslovakia as a youngster to live with an aunt and uncle in St. Catharines, Ontario. Cut to 1959, he became a Blackhawks superstar. Mr. Sikura was hooked. His family has cheered for Chicago ever since. Fast-forward to 2019. A 23-year-old Dylan Sikura wears No. 95 (he was born in 1995) for the Blackhawks. His brother Tyler, three years older, plays for Chicago’s AHL affiliate, the Rockford IceHogs. The two played together for the Blackhawks in a preseason game Sept. 21, 2018 and started on the same line. They didn’t make Chicago’s roster out of training camp but were together again to begin the season in Rockford. Dylan, however, was called up last month and has contributed to Chicago’s second-half push for the playoffs. 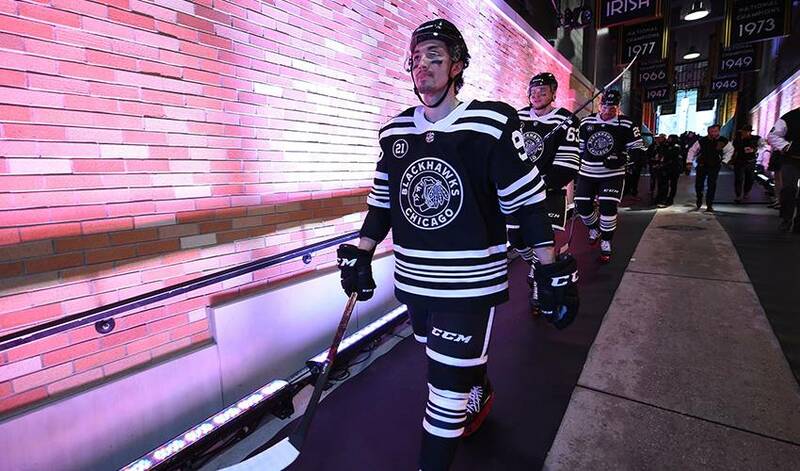 “It has been a dream come true,” said the 5-foot-11, 166-pound Sikura, who after his senior season at Northeastern Univesity concluded a year ago signed with the Blackhawks and played in their final five regular-season games. The family business is the Hill ’N’ Dale thoroughbred breeding farms in Aurora, Ontario, and Lexington, Kentucky. Dylan’s father, Glenn, runs the Canadian operation and uncle John is in charge of the U.S. outfit. Dylan and Tyler fell in love with hockey playing mini sticks in the basement of their family home. They come by their athleticism honestly. Their father was an All-Canadian wrestler at the University of Guelph. Their uncle, a centre, had stints with the Peterborough Petes, Windsor Spitfires, and represented Michigan State University and the University of Guelph in the 1970s. The Blackhawks wanted to sign Dylan after his junior season at Northeastern, but the speedy, smart forward wanted to experience his senior year. He played so well that 2018 Canadian Olympic team general manager, Sean Burke, invited Sikura to perform for the gold medal-winning Canadian team at the Spengler Cup after Christmas. Sikura also checked in with two assists in the championship game to lead his school to a 5-2 victory against Boston University to give Northeastern its first Beanpot championship in 30 years. He also was a top-10 finalist for the Hobey Baker Trophy that year, awarded the U.S. collegiate player of the year. The Blackhawks drafted Sikura in the sixth round (178th overall) after his third year of junior Tier II with the Aurora Tigers. He wanted time to develop. After an 11-game stay with the Blackhawks earlier this season Sikura earned a second promotion Feb. 11. The timing was perfect because the Blackhawks were scheduled to play in Boston against the Bruins the following evening. It just so happened that Northeastern had battled its way back to the Beanpot final to face Boston College at TD Garden. Northeastern head coach Jim Madigan invited his former standout player to address the team before the game and announce the starting lineup. “That was cool,” said Sikura, whose former teammates won their second straight Beanpot, the prestigious annual tournament that brings together Boston College, Boston University, Northeastern and Harvard for local bragging rights.